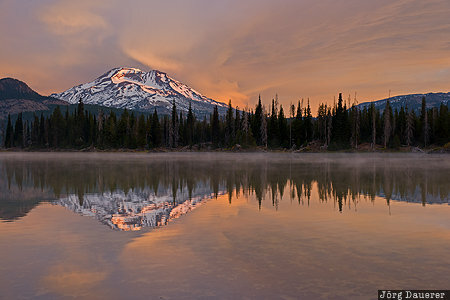 A colorful sunrise in the cascade range as the first light of the day illuminated the peak of the mountain South Sister and its perfect reflexion in the calm water of Sparks Lake in Deschutes National Forest. Sparks Lake is in Oregon in the west of the United States. This photo was taken in the morning of a cloudy day in September of 2017. This photo was taken with a digital camera.